Lightweight And Portable Vacuum Cleaner For Shop, Office Or Home Use. Easy to empty, dust canister minimizes downtime and maximizes vacuuming efficiency, with high performance filter, very quiet operation (low 61.1 dB/ high 72.2 dB). The BLACK+DECKER HHVJ315JMF71 SMARTECH 1.5Ah Cordless Lithium Hand Vacuum (Titanium) features battery sense which senses and displays the battery status as you clean so you're never caught off-guard, along with filter sense which alerts you when your washable filter needs to be changed. Lithium technology and dual power levels ensure strong suction when you need it; choose low speed for sensitive applications such as vacuuming curtains and linens, or choose power boost for extra suction with a push of a button. The handle is well balanced and comfortable to make it easy to use with a lightweight + portable design that makes for convenient cleaning. A pull-out crevice tool helps you clean hard-to-reach areas and the flip-up brush is ideal for dusting and cleaning upholstery. Cyclonic action helps keep the filter clean and suction strong. Includes: vacuum, jack plug charger, flip-up brush, extendable crevice tool, Vbf10 washable bag filter, washable plastic Pre-Filter. The Black & Decker BDH1600PL 16 Volt Lithium Ion Handheld Pivot Vac is made with lithium technology for strong suction and fade-free power. The innovative, patented nozzle pivots to clean up high, down low and even in tight spaces. The cyclonic action spins dust and debris away from the filter keeping suction power strong. The 3-stage filtration system with a pleated filter design offers the highest level of filtration to help prevent clogs and improve air exhaust. The Bosch GAS18V-02N 18V Cordless Handheld Vacuum Cleaner combines performance and runtime for a lightweight, convenient cleanup solution. This hand vac features two-stage rotational airflow technology for cleanup without losing suction power. The first stage typically captures 90% of debris, while the second removes finer particles, keeping the filter clog-free longer. The microfilter system filters fine dust, allowing the handheld vacuum to work in tough conditions. The powerful motor provides up to 21.2 CFM of airflow, with up to seven minutes of runtime per battery Amp hour (Ah) up to 42 minutes with a 6.0 Ah battery. With five attachments for versatility, this tool includes extension tubes to clean floors and a crevice tool for corners. Recently engineered to join the 18V lineup of power tools in this market, the cordless vac is 100% compatible with all Bosch 18V batteries. This is a bare-tool kit; the battery and charger are sold separately. This premium hand vac brings power and versatility to every corner of your home. Packed with a powerful 16 volt fade-free Lithium Battery means longer runtime, faster charging time, and continuous power. Its everything you need to get the job done, and more! A compact and lightweight design with three versatile cleaning tools and an adjustable folding handle for easy cleaning and storage helps you tackle any unexpected mess with confidence. Included Accessories: On-board Quick Flip<sup></sup> crevice tool. Above-floor dusting tool. Powered stair and upholstery tool. 18V LXT Vacuum Cleaner with High Performance Filter Lightweight And Portable Vacuum Cleaner For Shop, Office Or Home Use. Easy to empty, dust canister minimizes downtime and maximizes vacuuming efficiency, with high performance filter, very quiet operation (low 61.1 dB/ high 72.2 dB). 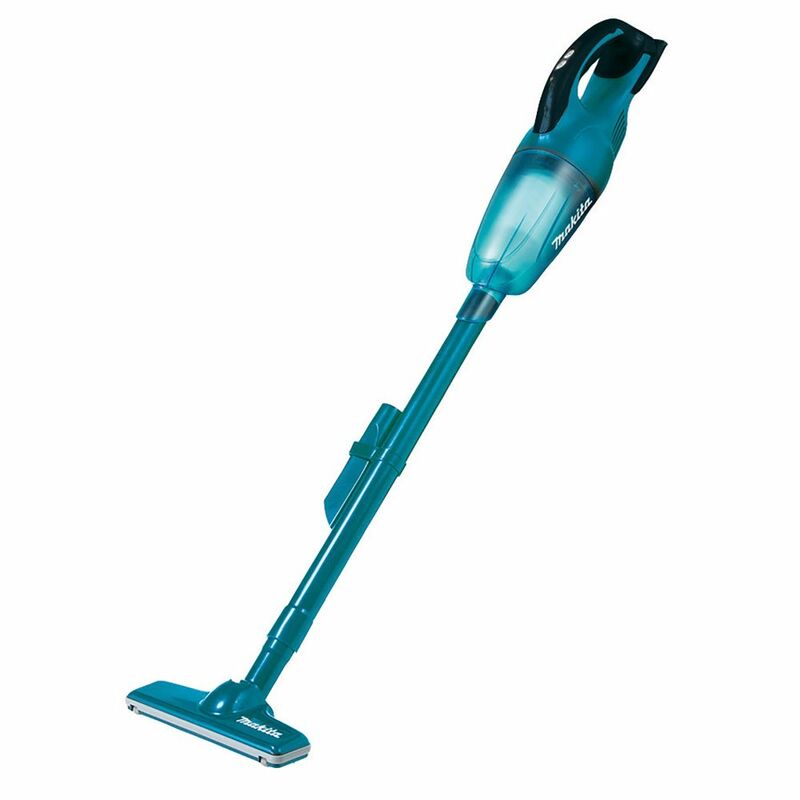 18V LXT Vacuum Cleaner with High Performance Filter is rated 5.0 out of 5 by 1. Rated 5 out of 5 by Adler1971 from Simple and efficient I’ve got it for a while and completely happy with it! Another great Makita product.